The second week of the field season (late April) took us to Southern Oregon’s Table Rocks to monitor the endangered dwarf wooly meadowfoam, Limnanthes floccosa,ssp. pumila. Upper and Lower Table Rocks are located in Jackson County and are unique volcanic plateaus that rise above the valley floor exhibiting a mixture of oak savannah, chaparral, woodland, and mounded prairie habitats. 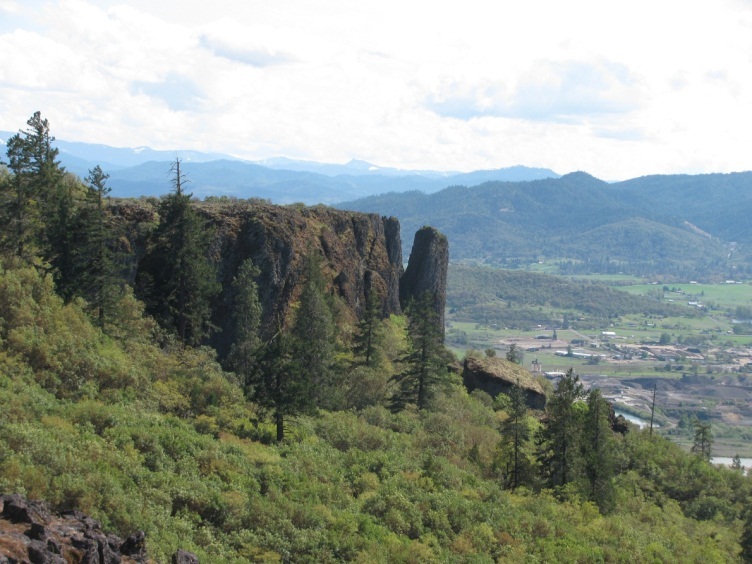 These unique geologic features are remnants of an extensive lava flow that occurred in the Rogue Valley millions of years ago. Since then, the Rogue River has meandered across the lava flow carving away and eroding the volcanic rock leaving only the two Table Rocks and a few solitary rock formations. The area is made even more unique by the presence of vernal pools on the rock plateaus. Vernal pool complexes occur in areas that have an impermeable substrate layer, such as volcanic rock, allowing water to seasonally pool and creating specialized habitat conditions. Oregon’s Table Rocks are the only location in the world in which dwarf wooly meadowfoam is found. Table Rocks has been designated as an Area of Critical Environmental Concern (ACEC) and ownership and management is shared by the BLM and The Nature Conservancy. The Institute for Applied Ecology began monitoring the meadowfoam population and conducting experiments on Lower and Upper Table Rocks in 2006 and 2007, respectively. The goals of the research include assessment of the impacts of trampling and grazing on meadowfoam survival and overall evaluation of habitat quality of the vernal pool complex. A detailed species description of meadowfoam was written by the 2011 NPSO interns and is available for reference under the May 11, 2011 blog post. As mentioned earlier, dwarf wooly meadowfoam is endemic to the Table Rocks, necessitating careful habitat management. 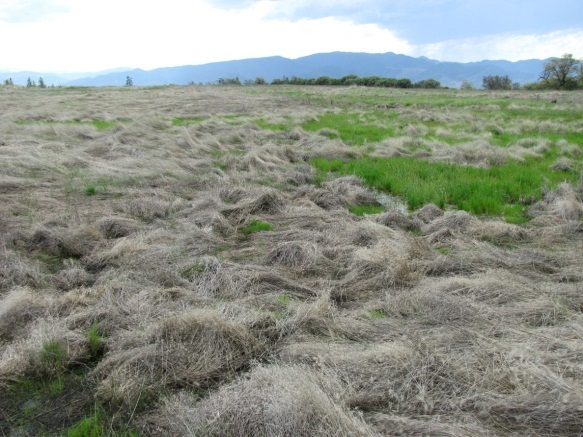 An invasive grass, medusahead, has posed a serious threat to native species by creating thick vegetative matting and outcompeting surrounding species for resources. Control of medusahead has proven difficult due to the persistent seed bank. Additionally, with over 10,000 visitors at Table Rocks every year, foot traffic can have a significant impact on the quality of the vernal pool habitat. This has specifically become a concern on Lower Table Rock where many people explore the pool edges in order to view the endangered wooly meadowfoam and search for the threatened vernal pool fairy shrimp (Branchinecta lynchi). Management decisions must take into account the desire for public engagement as well as the health of stressed species. 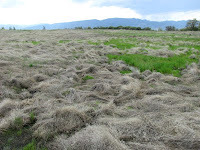 The 2012 monitoring visit consisted of individual plant monitoring within established plots, as well as the construction of experimental “exclosures” in areas where dwarf wooly meadowfoam is present. These exclosures, and their paired control plots, will be used to determine the degree to which trampling affects the survival and reproduction of this species. Continued monitoring of the plants within the exclosure plots will help inform future management decisions regarding recreational use and regulations concerning the timing of pedestrian visitation to the vernal pools on Table Rocks.